What are Windows Collaboration Displays? Windows Collaboration Displays define a new category of devices and aim to disrupt and digitise work spaces in a unique way. They are thought to be used in small and large meeting rooms, Huddle rooms, classrooms and open layouts and offices. The big difference compared to other solutions are the integrated sensors, the Azure IoT integration and the one cable-connect approach with USB-C.
Why should you invest in a Windows Collaboration Display? Collaboration is critical to business success, so choosing the right tools to enhance and accelerate teamwork is essential to increasing productivity and collaboration in the workplace. Windows Collaboration Displays are another option to digitally transform your meeting rooms and create innovative modern workspace. Due to the cooperation with Microsoft the devices should perfectly work with Office 365, Skype and Microsoft Teams. With the integrated cameras, microphones and speakers they serve as full video and audio-conferencing systems and collaboration devices. In a building that allows to optimise the facility management, the WCD’s can help to make heating and cooling more efficient and save energy. No additional sensors need to be installed and due the Azure IoT integration companies can create smart space solutions. If you are investing in a modern working environment and have a Microsoft strategy you should consider the Windows Collaboration Displays and check if they fit your needs. 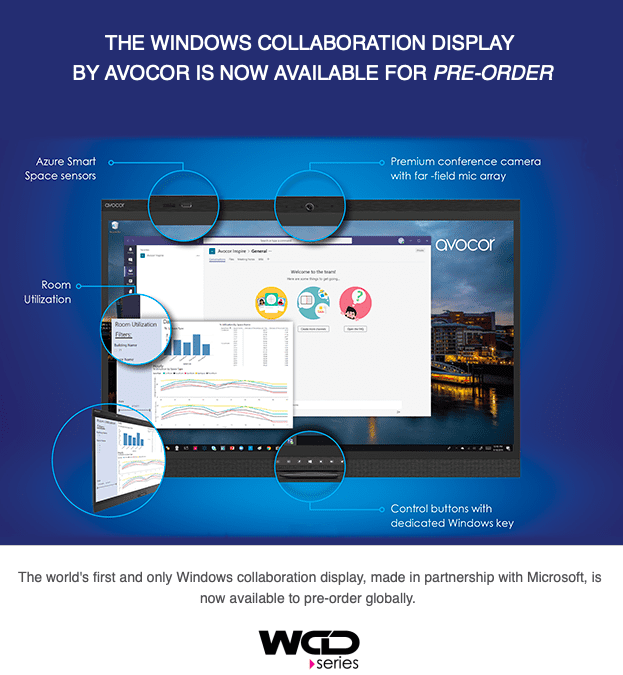 The Microsoft WCD from Avocor as a 65’’ display with a 4K resolution, 20-point InGlass Intelligent Touch and supports up to 4 pens with eraser and simultaneous pen and touch. There are sensors for room temperature, room brightness and proximity. The display can be used with a USB-C cable that combines 4 cables into 1. It includes DisplayPort, USB, Power and Ethernet. 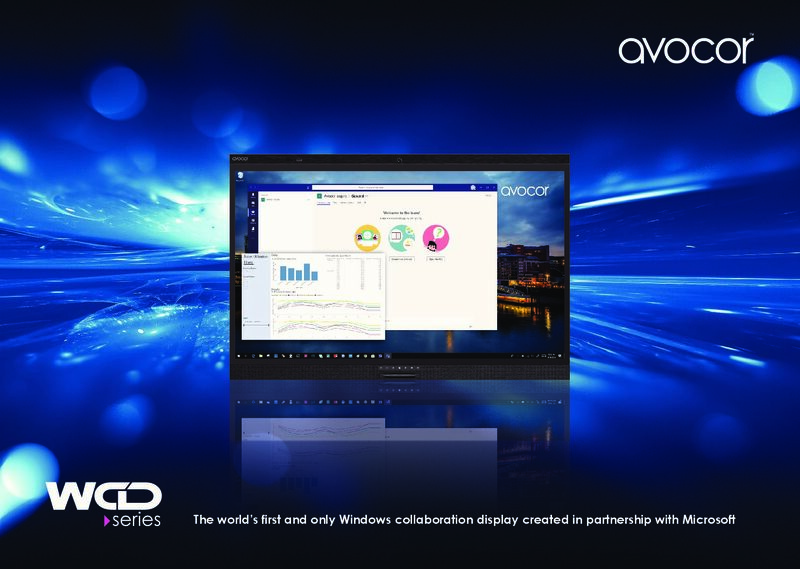 The Avocor display is the only one certified for Skype for Business and Microsoft Teams and Azure. Avocor will showcase their screen at ISE 2019 but you can pre-order with Digicom today. The Microsoft Avocor WCD contains a dedicated Windows button on the front control panel. The Microsoft Windows collaboration display by Avocor is an out-of-the-box, all-in-one solution featuring a single USB-C cable to get meeting started easily and ontime. The first display available globally that is certified for Skype for Business, Microsoft Teams and Azure. First interactive display to incorporate built-in sensors which connect to the Microsoft Azure IoT Digital Twins platform, allowing for intelligent, environmental data reporting. Contact Digicom today for further details on Avocor Windows Collaboration Displays.